Club Hotel, Fraser Street, Clunes, was built in 1879, but little else is known about the structure. The building is stuccoed and presumably is constructed of brick. In seven main bays, the structure is narrower at ground level, due to the carriageway, but is still symmetrical. The cast iron verandah has a curious arrangement of columns, has delicate brackets and the upper storey has presumably been removed. The detailing includes a name plate. 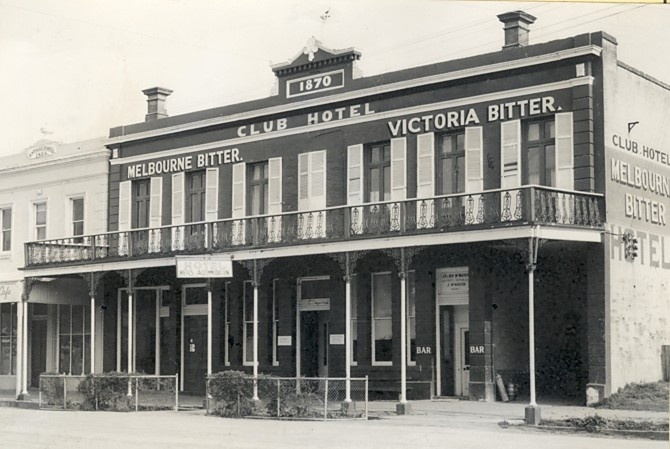 Club Hotel, Fraser Street, Clunes, is an important element in the streetscape of the historic former goldmining town of Clunes and is architecturally notable both as a typical hotel of the period and for certain distinctive elements of its Conservative Classical detailing. The iron verandah over the footpath is notable despite its apparent defacement, the triple window motif is unusual for this time and the name plate and french doors are of interest. Club Hotel, Fraser Street, Clunes, is in fair to good condition and is understood to be reasonably intact.